Voted the best of Raleigh NC Roofing Companies! All of our roofing materials are hand nailed to our customer’s roof. Why is this better than using a nail gun? The answer is simple: there is a very small area that nails can be used on an asphalt shingle risking blown shingles. Our professional and experienced roofers ensure correct placement of each nail along with the correct depth. Each nail is flush. With nail guns, there is much more margin for error between over-driving and under-driving nails and other fasteners. That only increases the possibilities for leaks and blown shingles. Not all roofing companies and roofing contractors hand nail. We do! So when considering roofing companies in Raleigh NC, consider the way in which those roofing contractors actually nail the shingles. Small details, while seemingly small, make a major difference in the performance of your roof shingles. Hire the quality roofers of Housetop Roofing Company today! Many roofing companies and roofing contractors will use non employees in the installation of their roof systems in Raleigh NC. At Housetop Roofing we only use in-house employees so that we can guarantee total satisfaction with your new roof. Finally, one of our job foremans will be present from beginning to end of every roof installation. Why does this matter? The reason is simple: subcontractors have their own businesses. Their business names and reputations are not at stake. Roofing companies in Raleigh NC that have their reputations at stake will tend to go “the extra mile” to make sure their customers receive the quality workmanship and materials that they deserve. All of this serves to reassure our customers that we take their home roofing system seriously. All of our work is done by actual employees, unlike many other roofing companies in Raleigh NC. So if you want the trustworthy roofing contractors in Raleigh NC, call Housetop Roofing Company today! Roof replacements in Raleigh NC, Wake Forest NC, etc. Call Housetop Roofing Company today! They are the best roofers! Head and shoulders above other companies. Months ago my area had a weather issue that caused many homes to have [a] roof replacement…. After my husband had checked out all the neighbor’s roofs he said Housetop was the only company that put the drip edge on correctly. They are the best! Do you need help with your roof and have any other home improvement concerns? Selecting a roofing contractor or roofing company in Raleigh, NC or anywhere else is a big decision. That’s why, when you’re researching roofing and home improvement companies in Raleigh, NC, we hope you’ll give Housetop Roofing and Home Improvement a call. Housetop Roofing is proud to be a member of the Home Builders Association of Raleigh – Wake County, the North Carolina Home Builders Association (NCHBA), and the National Association of Home Builders (NAHB). Why does that matter? Because we are a member of our community and the community of home builders. 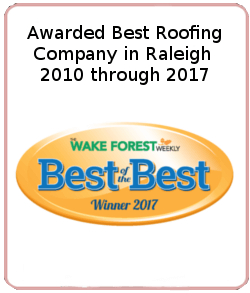 We have been a roofing company serving Raleigh NC and Wake Forest NC for decades with an A+ rating with the Better Business Bureau. When you get the help of our dedicated roofing team in Raleigh NC and surrounding communities, you’re getting decades of dedicated service. We never compromise on durability and quality for a price point and neither should you. Whether you need high-quality installation, secure roofing systems, ongoing maintenance, or repairs— we’ve got you covered. By partnering with our roofing company in Raleigh, NC, you’ll get the look you want and the quality you need at a price you’ll love. So when making your choice for a roofing company in Raleigh NC or Wake Forest NC give Housetop Roofing Company a call! Thinking about getting roof repair from roofing companies in Raleigh, NC? Although you may have many home improvements you want to complete, like a remodeled kitchen or a new patio, one less exciting task (but ultimately more important) is roof repair. Neglecting your roof can actually lead to high energy bills, extensive damage, and eventually the high cost of repairing it after a disaster. That’s why it’s important to be able to spot the signs you need to call a local roofing expert. With that in mind, here are 8 signs you should call a roofing company in Raleigh NC. Ready to Contact Housetop Roofing | Raleigh, NC? If you’re thinking of hiring roofers from a roofing company in Raleigh, NC, don’t hesitate to talk to us at House Top Roofing Company. With free and accurate estimates and written guarantees for all workmanship, it’s no wonder that Housetop Roofing is North Carolina’s favorite home improvement company. We offer a full complement of top quality home improvement services with guaranteed craftsmanship second to none. Housetop Roofing Company President Robert Williams has over 30 years of experience in roofing and home improvement services. Born and raised in Wake Forest, he’s also got a lifetime of old-fashioned North Carolina values under his tool belt. If you want your next home improvement or roofing project to be a quality custom job done by some neighborly folks who you can trust, call Housetop Roofing Company and Home Improvements. Let us show you why we’re the best, most trustworthy home improvement & roofing company in Raleigh NC. Serving the following markets: Raleigh NC, Wake Forest NC, Cary NC, Morrisville NC, Wake County NC. If you’re ready to get started, contact us today! 27511, 27518, 27529, 27545, 27560, 27587, 27591, 27601, 27603, 27604, 27605,27606, 27607, 27608, 27609, 27610, 27612, 27613, 27614, 27615, 27616, 27617, 27703.